I understand from a previous post that APDL does not allow a show time to be adjusted for later than a scheduled departure time. When I have a delay and an adjusted show time in the morning for minimum rest, changing the scheduled departure time of the flight would change my pay as we are paid for the greater of actual or scheduled. Is there a way I can adjust my show time but still have it calculate pay correctly for the scheduled duty period as opposed to actual? Unless your company is doing something shady, an adjusted/delayed departure time should include an equal adjustment to the arrival time. That would fix the issue. Even if they didn’t adjust both, you adjusting both in APDL so the scheduled duration remains the same will resolve your problem. They do adjust the arrival time but the problem arises when the adjusted schedule results in a shorter duty day, and thus less duty rig pay. Let's say I am supposed to have a showtime of 6:15AM for a 7:00AM flight. This flight arrives at 8:00AM and then I have 4 hours until a second flight departing at 12:00PM and arriving at 1:00PM. Now lets say they delay the first flight so that it is a 10:15AM showtime for an 11:00AM departure arriving at 12:00PM and then the second flight as originally scheduled. The original schedule has a duty time of 6 hours and 45 minutes but the adjusted schedule has a duty time of 2 hours and 45 minutes. This means I should be paid 3 hours and 22.5 minutes of duty rig but the app will record it as 1 hours 22.5 minutes of duty rig. How can I make it so that it records the pay correctly? That’s a somewhat rare specific case I hadn’t considered previously. The only way to achieve this as of now would be a pay adjustment entry. I logged this situation for review to be implemented at a later time. Thank you! How do I create a pay adjustment entry? 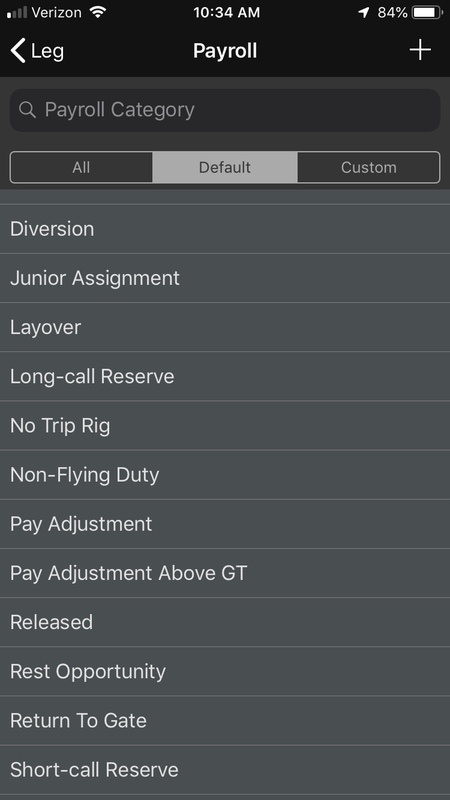 Pay adjustment is a payroll category. Create a new entry and choose pay adjustment for the payroll category and that will change the display from the normal leg view. I don't seem to have that category under payroll. My options, alphabetically, go from Junior assignment, No Trip Rig, to Rest Opportunity, Return To Gate. I don't see Pay Adjustment? Here is what I have. The only thing I can think of is if you don’t have the latest version of the app maybe? There is a filter at the top of the payroll category screen with three tabs. I am showing version 9.0.3.0 and I don't see anywhere I can force update. Is that the most recent version? I don't seem to have the same options as you show in your screenshot. Attached is a screenshot of what I have available. Is there a way I can add those categories? I had a rest “show time” change yesterday, and was able to change the show time to show a 10 hour rest.. looked good for me at this point.. Thanks, it turns out it was archived!